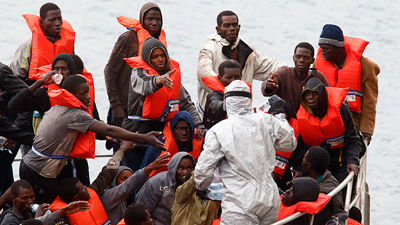 Tunisia struggles to host migrants saved at sea - SABC News - Breaking news, special reports, world, business, sport coverage of all South African current events. Africa's news leader. Surrounded by other people’s belongings piled high on beds, Georgie Ndab wants to leave Tunisia’s only migrant centre and take her baby to Europe. “I thank Tunisia, but the situation here isn’t good, and my direction is Europe, France,” added Ndab, who travelled through Nigeria and Niger to reach North Africa. The facility is the only one in Tunisia to host migrants who reached the country illegally, either being picked up by authorities near Libya or in waters off the country’s coast. “Tunisia does not properly take care of migrants,” said the 32-year-old, who told AFP he was enslaved in Libya and forced to work in construction before boarding a boat for Europe. The Red Crescent centre opened in 2013 and after losing some of its funding earlier this year is struggling to raise the 320 000 dinars ($114 000, 100 000 euros) needed to cover its annual costs. While Tunisia is striving to manage its migrant population, the European Union has suggested the country could play host to a “disembarkation platform” to process those rescued at sea. At the end of July, Tunisia said it would take in 40 migrants rescued by a commercial vessel but wary of setting a precedent, said it was only for humanitarian reasons. A number of those saved by the Tunisian-flagged “Sarost 5” ship were taken in by the Medenine centre. Romdhan Ben Amor, from the Tunisian Forum for Economic and Social Rights, said Tunisia cannot become a reception country while it “does not guarantee the rights of migrants”. When it comes to those who have entered Tunisia illegally with the aim of travelling onwards to Europe, the United Nation’s migration agency said the country is ill-equipped to manage these arrivals. “Tunisia has neither the legal framework nor the humanitarian infrastructure nor the economic development necessary,” said Lorena Lando, from the UN’s International Organization for Migration. This entry was posted on 14 Sep 2018,06:27AM at 6:27 AM and is filed under Africa, News, Homepage Latest Stories Slider. You can follow any responses to this entry through the RSS 2.0 feed. Both comments and pings are currently closed.